The Aputure Deity is a shotgun condenser microphone. It is a professional microphone that has incredible sound performance along with the best quality audio. This 25 centimeter long microphone can be used for films, interviews, vlogs, documentaries, and just about any other creative thing that you could come up with. Aputure Deity captures what you want it capture, and the sound is very clear. It works for just about anyone in any location. It works with a super cardioid polar pattern, which means that it is directional. If you’re aiming the microphone in a specific direction, or rather one person, then any other noises coming are very low. It minimises ambient noise, so it really captures the voice of whoever you’re aiming it toward. It has a coded printed circuit board. This means that if you were to drop it in water, you just have to let it dry for a couple days and it would still work. This doesn’t mean that you should drop it in the ocean as the sound wouldn’t be great, but if you were to accidentally drop it in a puddle, you’d be good to go. Because this is a condenser microphone, it can’t just power up by itself. You need a 48V phantom power from the recording device that you’re using, which most have. Even still, the microphone quality gets even better. It has low self-noise. With it’s anti-radio interference, it won’t get much background noise. You want a shotgun microphone to really capture the point of what you’re creating and that’s exactly what this microphone does. The build and rugged quality is great, and it’s a little bit heavy, but it works beautifully. It’s made up of brass so the RF rejection is really good. It’s made from solid brass and a gold coated PCB board. You can also buy an add-on kit. This add-on kit comes with a waterproof suitcase, an auto air-pressure balance feature and a shock mount and windshield. 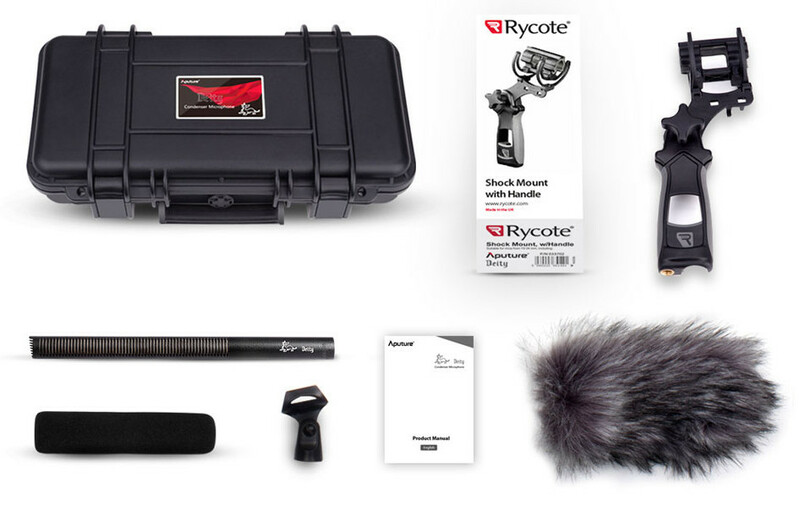 (The shock mount and windshield system are from Rycote because they’ve partnered up). The Aputure Deity microphone itself costs $359.00, and the Deity Kit costs $429.00. For everything you get—that’s a great price for the kit. So, what do you think? We think it’s pretty great. Do you want to hear it in a real world test? then watch Tom Antos give it a quick once over. FCP Audio is a leading provider of royalty free Final Cut Pro Music. If you need affordable, easy to edit, easy to customise music, we can help.